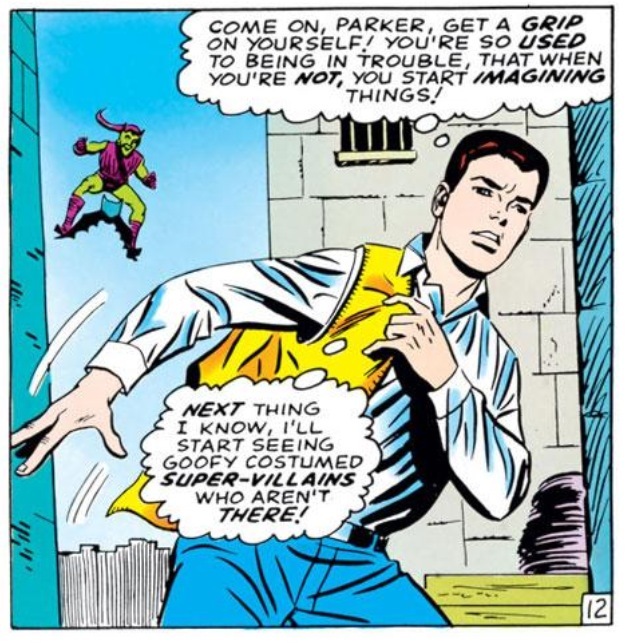 What better way to mark Halloween here on Chasing Amazing than with this iconic comic, Amazing Spider-Man #39? The featured villain here is the Green Goblin, a ghoulish adversary who uses pumpkin bombs as his weapon of choice, and has come back from the dead on numerous occasions. The Goblin even famously unmasks in this issue, as the ultimate trick and treat for Spider-Man fans, who had been treated with a long-running mystery about the villain’s identity going back to his first appearance in ASM #14. But beyond the “topical” nature of this issue, ASM #39 also goes down as my favorite Spidey cover of all-time, which makes sense because the artist who supplied the illustration here is my favorite Spidey artist of all-time, John Romita Sr. And not only did Romita draw this issue, it was his first Spidey issue on art, replacing the originator, Steve Ditko. Not too shabby for a guy to make his debut and put forward perhaps one of the most famous covers in comic book history. And though I was a child of the 80s when Todd McFarlane was breaking in, and Mark Bagley’s Spidey from the 90s may have drawn the most commercially recognizable version of Spider-Man, it was Romita’s artwork that drew me in as a collector. There was something so stylish and “special” for lack of a better word, about his artwork, that I came to think of JRSR’s issues as a work of art. And like any art collector chasing after Picasso’s or Rembrandt’s, I had no qualms dropping my hard-earned money on Romita’s work. 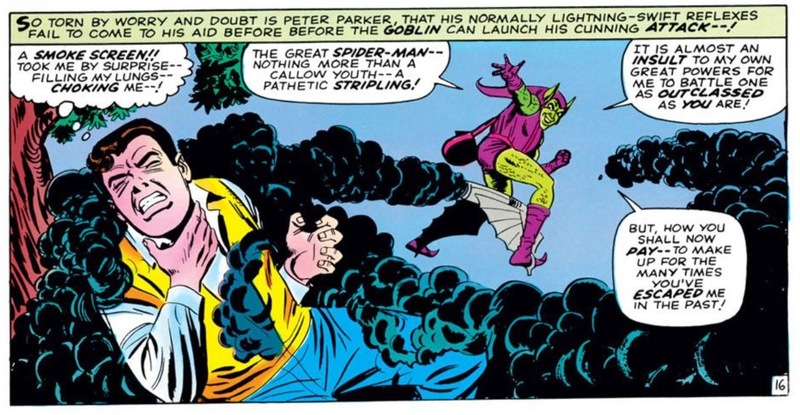 I always thought as the Ditko issues as the historic ones, while Romita put forward the showpieces. As a younger collector, my affinity towards Romita linked me to an older generation of fans. I remember sitting in my 7th grade science class talking comic books with some of my classmates and my teacher overhearing and asking me if I had any Romita in my collection. Of course I did, which ultimately led to a conversation about our favorite Romita covers. Of course, that was years before I would come to own ASM #39. 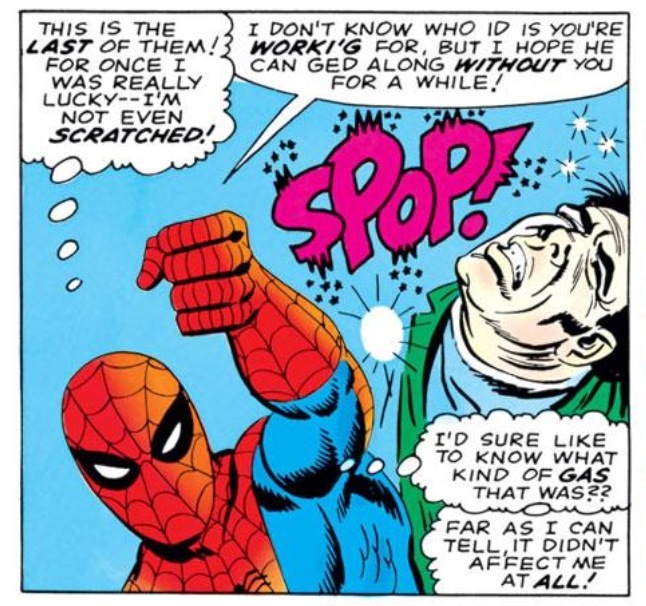 Despite loving the cover of ASM #39 for years, I didn’t always associate the image with this issue. When I was younger, I remember seeing a holiday variation of the image, with Green Goblin wearing a Santa hat and Spider-Man/Peter Parker tied-up with a festive green garland, as part of an print ad for a comic book retailer (maybe Mile High Comics, or an ad for a Marvel subscription, but I can’t be sure). But even if that goofy context, I always thought highly of the image. I just loved the level of detail with the two characters. The Goblin actually looks menacing with his muscular definition. Peter looks less like a cartoon and more life-like. Even the ranges of colors used for the illustration appear to pop more (I’m not an art critic, so if any of my analysis comes across as crude, I apologize). 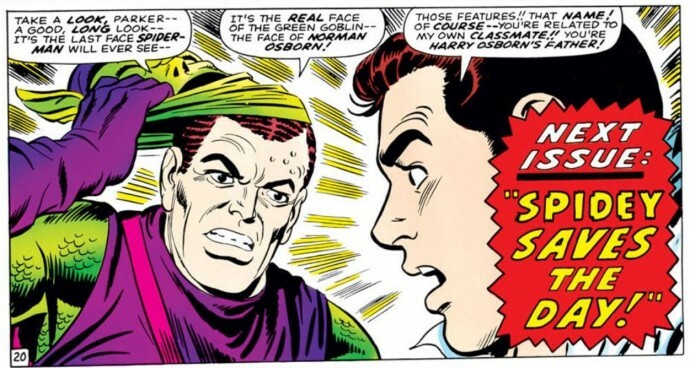 When I came to own ASM #40, the issue where Green Goblin’s origin is first explained, I knew that one day I needed to own ASM #39 in order to complete this very famous storyline. Yet, I still didn’t realize that the image of Goblin and Spidey I had come to love so much, was the same one that graced the cover of ASM #39. I can’t say with any certainty when I eventually connected the dots and figured it all out, but needless to say from that day forward, I didn’t just want this issue as a completist, or as someone who wanted to finish off a particular storyline, but as someone who had a long emotional connection to the artwork without even realizing it. As a result, I came to own this issue due to great patience and perseverance. I would never have the money to buy this comic in pristine condition, but I also couldn’t make the faux pas I made with ASM #25 and just buy it in any old condition because it was cheap enough. I had to be nitpicky about my copy of ASM #39. I was willing to take a low-grade copy but with no other compromises – that means not buying a comic with any writing or drawing on the front cover, no major tears or holes and no blatant mailing creases down the middle. So I waited. 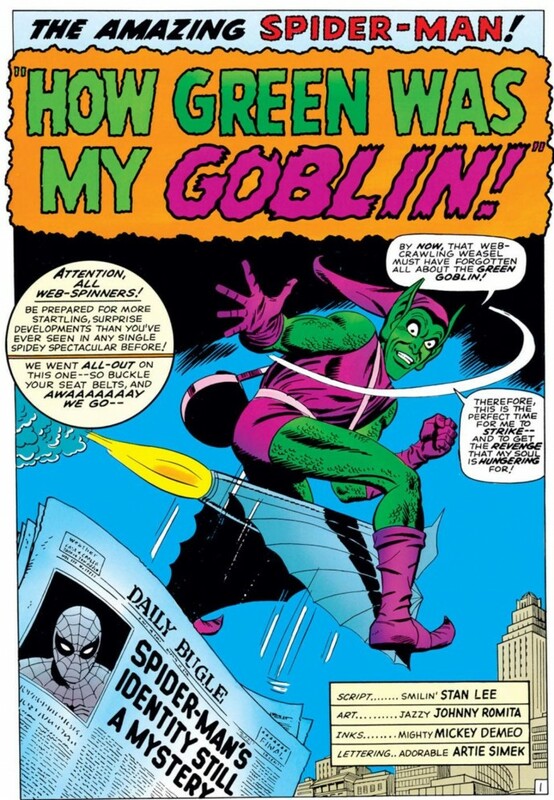 For months, I remember one of the online retailers I liked to buy from had a VG copy of this comic that was otherwise beautiful, but had one major flaw – right underneath the flame of Goblin’s glider, someone wrote “no sale” in blue marker. It was probably just a retailer, but I would have hated myself if I bought a copy of this comic book that had damaged this image in any tangible way. Blue marker was a deal-breaker. I searched shows and eBay and still couldn’t find a copy of this comic book that was both low grade and attractive enough for my tastes. And then eventually that same online retailer had this copy for sale (along with the “No Sale” copy – after nearly six months, nobody else took the bait). Sure, this is not the world’s most beautiful copy, but I think it’s a great representation of the grade, a G/VG that it no way presents damage to the cover image in any significant way (the crease on Peter’s left leg may be the worst of it). This comic has now been in my collection for a few years now, and it’s still one of the few older issue I routinely take out of my short box and gawk at. Sometimes, you just can’t explain why you love something the way you do, though I doubt few are going to quibble with about the fact that this is one of the finer ASM covers in the comic’s history. 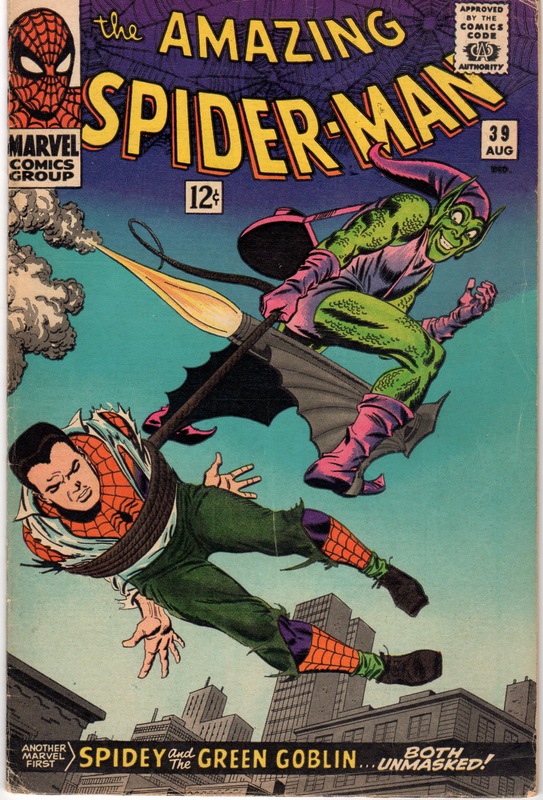 I like to say that even if I wasn’t a Spider-Man collector, I would have eventually sought this comic book out, but I think one of the main reasons why I came to love the Spidey series was covers like these, and Romita’s awesome work that followed. 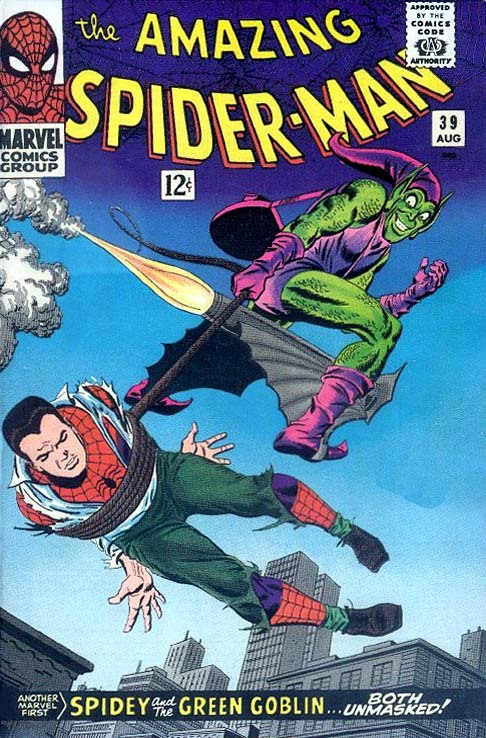 Tags:Amazing Spider-Man 39, favorite covers, Green Goblin, Jon Romita Sr. This is the first issue of ASM I ever read. Found a Marvel Tales version tucked away in the attic under a bunch of my brother’s old Playboys. I liked it almost as much as Miss July, but it couldn’t hold a candle to Miss January. It’s from around Christmas 1985, updated with the Hobgoblin. I love the Romita covers from the 60’s as well. There’s something about the way he uses the space that makes do a double (or triple) take.